"Finished" With Your Dishes? Try Finish Boosting Products! My Dishwasher Before Using Finish Dishwasher Cleaner! In July I bought a new home, and then was tasked with selling my previous home in only one week! We painted the entire house from top to bottom, decluttered, took care of minor repairs, and made sure that the electrical and plumbing were in perfect working order for the new owner. What nobody told me about selling my home, was that prospective buyers would open up every single drawer, cupboard, closet, medicine cabinet, refrigerator, oven--and even dishwasher! Our old dishwasher was built-in under the kitchen counter and showed signs of age (see top photo). As replacing the dishwasher was not in our budget, I wondered how to get it really clean before selling our house? This was the same dishwasher that I wrote about last year in my blog post Help! There's a Mouse In My Dishwasher! (Yes, somehow MICE had gotten into my dishwasher the previous year!) I wish that I had heard about Finish Dishwasher Cleaner at that time! 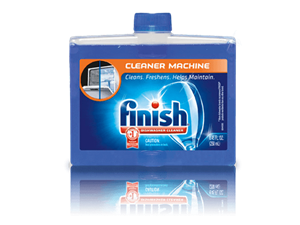 It was good timing that I found out then about Finish Dishwasher Cleaner, which is designed to intensively clean visible and hidden dishwasher dirt build up. Previously, I had just cleaned the actual dishwasher by removing all the dishes from it, and putting it on the "wash" cycle. But if I had to take a good guess, I would say that previously I was not removing lime scale and grease build up. After all, doesn't a cleaner dishwasher mean cleaner dishes too? I easily followed the instructions, below, to clean my dishwasher with Finish. When the cleaning cycle had completed, I opened up the dishwasher to check out the results. After using the Finish Dishwasher Cleaner, it was noticeably cleaner and felt "squeaky clean" to the touch. I did not see any errant food deposits or films from sauces. It made me feel confident that prospective home buyers were seeing (and smelling) the cleanest dishwashing machine possible! Finish Dishwasher Cleaner WILL Get Your Dishwasher Clean! 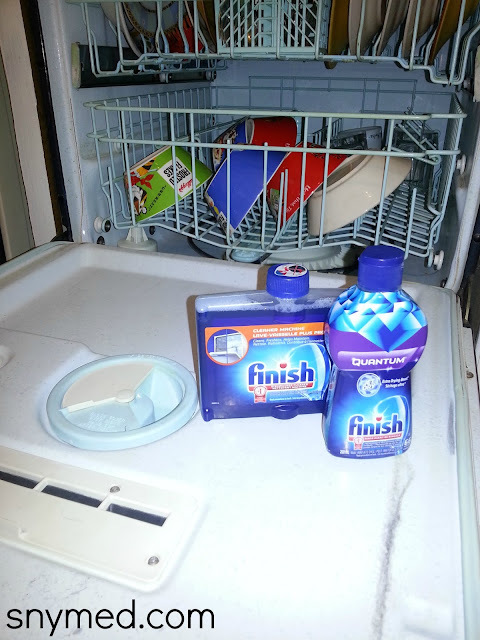 Finish Dishwasher Cleaner was very easy to use, just follow the steps below. For best results, use once a month. 1.Remove the sticker from the top of the Finish Dishwasher Cleaner bottle without removing the cap. 2.Be sure that the dishwasher is completely empty. 3.Place the bottle of Finish Dishwasher Cleaner upside down in a dish rack, or in a secure position. 4.Run the dishwasher and you're done! When I was done cleaning my dishwasher, I noticed that the glass fruit bowl on my kitchen table looked cloudy, although I had recently washed it in the dishwasher. This was supposed to be a focal point in my kitchen, when staging the table with a bowl of fresh green apples. (Home staging is a very popular trend in the Toronto housing market.) But instead of looking fresh and clean, the fruit bowl looked old and tired. For an elegant look, I also wanted to stage the dining room table with wine glasses, but many of my "clean" dishwasher washed glasses looked foggy, or had a film on them! I decided to try Finish Jet-Dry Rinse Agent to see if I could get my glassware sparkling clean! Trying to understand what was happening to my glassware, I looked a little more into the issue. Apparently with detergents, food and chemical residues can redeposit on dishware during the rinse cycle, causing spots and residues to remain. However, the Finish Jet-Dry Rinse Agent was designed to combat this problem by rinsing away leftover food and detergent residues. As it wicks away the residue, it also helps the dishes become more dry than using dishwasher detergent alone. I rewashed my wine glasses and glass fruit bowl in the dishwasher, this time with Finish Jet-Dry Rinse Agent added to the load. When I took out the glassware to check on the results, I was delighted to see that using Finish had made a huge difference! All the glass was now sparkling clean, and no longer had a cloudy or foggy look to it--and the film covering the wine glasses was gone! NOW I was ready to stage my home using the glassware as a centerpiece, and because I didn't have to hand-wash it, I had extra time to pack for the upcoming move! Find Finish Jet-Dry Rinse Agent in Stores Everywhere! Finish Jet-Dry Rinse Agent was also very easy to use, following the steps below. 1.Fill the dishwasher rinse agent dispenser with Finish Jet-Dry Rise agent. 2.Finish Jet-Dry Rinse Agent is automatically released in the rinse cycle each time the dishwasher runs! Have questions about cleaning dishes in the dishwasher, or about the dishwasher itself? Check out Finish's website Dishwashing Expert! 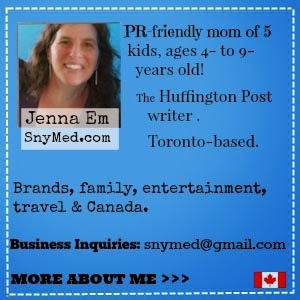 Disclosure: I am part of the Finish Canada Blogger Campaign with Mom Central Canada and I receive special perks as part of my affiliation with this group. The opinions on this blog are my own. Do your dishes usually come out clean from your dishwasher? Have you ever tried Finish products? I'm a huge fan of Finish products! Its all we use for our machine. I'm very sensitive to scents in the sense that I can easily pick out even the faintest odor. Before we learned about Finish Jet Dry, I just about stopped using our two week old machine (at the time,) 'cause I could smell chemicals and "something else" on the supposedly clean dishes, and couldn't use those dishes until I hand washed them again. The Hubs thought I was nuts, haha. Jet Dry actually saved us from finding the washer a good home, lol. Thanks for the great post, it brought back some interesting memories, LOL! Aeryn Lynne, my husband also have an excellent sense of smell. Sometimes he won't eat a food (that is supposedly fresh) because it smells "off". I bet you can relate! I use the Finish Jet-Dry Rinse Agent and it really does make a difference. I haven't tried the cleaner yet, and will put it on my grocery list. Thanks for sharing. I love the dishwasher cleaner - makes such a big difference - I never even knew I need it. Now I use it all the time! Hmmm, maybe I should try this. We have an old dishwasher too (rental unit) so it would be nice to know it's at least really clean. :) And as a renter, yes, I open EVERYTHING when I'm trying to rent (and I've been disgusted by the fact that the home we move into is ALWAYS dirty, especially when I spent hours cleaning the home we moved out of). I'd love to move into a place with a clean dishwasher and a clean oven! I've never tried these products but cleaning the dishwasher sounds like a great idea. We have an older dishwasher too (because we have a rental house) so I can't replace the dishwasher, but I could make sure it's clean! Thanks for sharing. I never thought about how people would look inside my dishwasher. We're not selling our house yet but I'm sure that I should clean it anyways. I didn't even know that a product like this existed. Thanks for sharing. I have used their products but have never tried the dishwasher cleaner. I think I may have to pick up a bottle of it and give it a try. If I had a dishwasher, you've convinced me to use this product lol The only dishwasher I have now is called, my husband! LOL Thanks, I'll recommend this to my sister! Me too Annie1.........That was a great review and promotion for the "finish" products for my dishwasher! I have never washed my dishwasher before, I'm thinking it's time now. Going to head to the store later and find the Finish machine cleaner! thanks for the review.